Apple announced new MacBook Pro Retina models, giving its 13-inch and 15-inch laptops a specs boost and even more appealing price cuts. The 13-inch MacBook Pro Retina is going to be faster and lighter than the previous generation. It's 3.46 pounds and 0.71 inches thin, announced Phil Schiller, Apple's senior vice president of marketing. The new 13-inch MBP Retina contains a Haswell processor, matching Intel processor that's in the current generation MacBook Air notebooks. That means, even with the high-resolution screen, it has 9 hours of battery life. The notebook also comes with Iris integrated graphics, 802.11ac Wi-Fi and a Thunderbolt 2 connection. All of this fits into a 0.71-inch package that has a starting price of $1,338, down from the previous generation's $1,649 price. The 15-inch MacBook Pro Retina doesn't change its form factor from last year's version, but the Apple notebook refresh does include Intel's 4th generation quad-core processor, Haswell. Also, like the 13-inch version, the bigger MBP has a longer battery life, clocking in at 8 hours, according to the company. Its Iris-integrated graphics can be boosted by an optional GeoForce GT 750 card upgrade, and all configurations come with 802.11ac Wi-Fi and Thunderbolt 2. 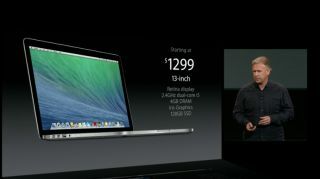 Best of all, it starts at $2,499, down from $3,199 price of the original 15-inch MacBook Pro with Retina. Both the 13-inch and 15-inch MacBook Pro Retina display updates start shipping today, noted Schiller, and are on sale in the Apple Store online right now. Check out our Apple iPad event live blog!